Vancouver is working hard to shake off its reputation as a somewhat pious city that values good mountain views over vibrant streetlife. Its architecture has seen a shift away from the back-to-nature style of the 1970s, 80s and 90s towards something bolder and more urban, like the recently-completed Woodwards redevelopment. There seems to be more tolerance for cheeky public art — witness Douglas Coupland’s Digital Orca (which makes up for all the lame whale murals around town) and Ken Lum’s Monument for East Vancouver. 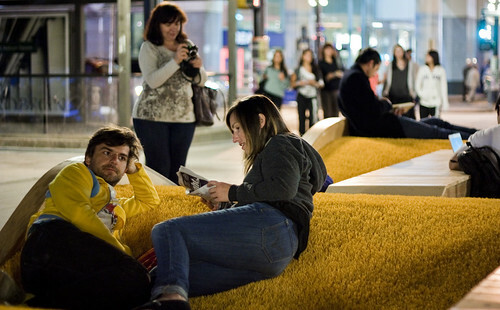 And there is more and more playful new street furniture. 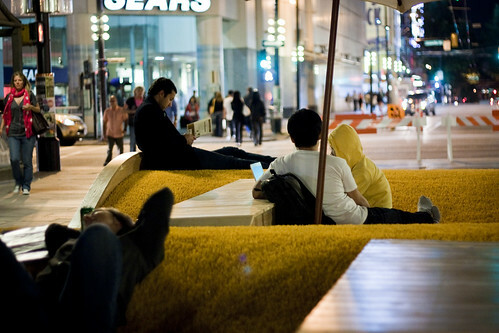 Last week, I came across one such piece of furniture in front of the Vancouver Art Gallery. 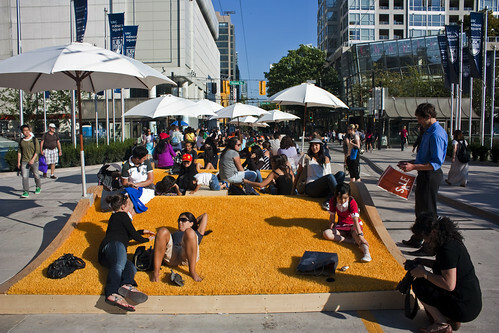 The stretch of Robson Street in front of the gallery had been closed for construction for several weeks; when it reopened, a kind of undulating fake lawn was installed. 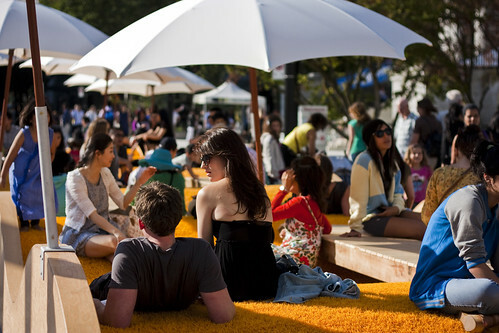 It had bright yellow “grass” and was shaded by white umbrellas; it was a bright, sunny afternoon and the lawn was thronged with people. I returned later, after the sun had set, and sat down for awhile. A couple of guys laid down on the grass, holding hands, and one of them wondered aloud, “What is this doing here? This is so weird!” But if others thought it was strange, it didn’t show. A couple of people worked on their laptops, faces lit by the screen’s blue glow. Others sat cross-legged, talking to friends. It was as if it had always been there. UPDATE: Plenty of new information has been posted about the Robson Street installation since I originally wrote this post. Named Picnurbia, it was designed by Loose Affiliates, a group of Vancouver architects. You can read an interview with them at the excellent This City Life blog. Spacing Vancouver has also run a nifty timelapse video of the installation. 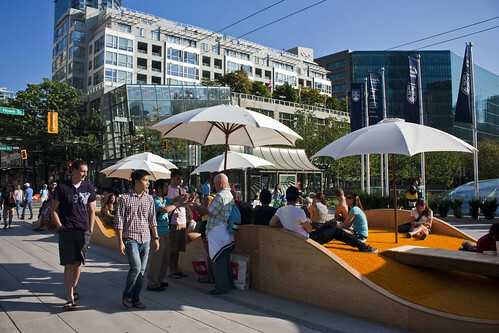 This entry was written by Christopher DeWolf , posted on Wednesday August 17 2011at 03:08 am , filed under Architecture, Art and Design, Canada, Public Space, Society and Culture, Video and tagged Public Art, Street Furniture, Streetlife, Urban Design, Vancouver . Bookmark the permalink . Post a comment below or leave a trackback: Trackback URL.